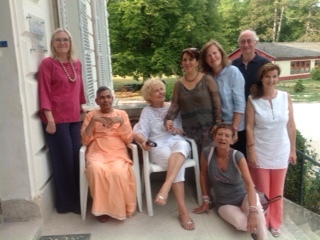 The LKB Soul Lab team (Kris, Lucienne, Francoise and Veronique) with Swami Veetamohananda and some of the participants at the Vedantic Centre in Gretz, France July 15th & 16th 2015. – the power of stones to heal the soul. Feedback from participants indicated that they truly appreciated the quality and purpose of all the workshops. Healthy vegetarian cuisine, a comfortable private room and a wonderful working space at the Vedantic Centre made for the perfect break from the working year and an excellent preparation for the holiday period. LKB (Lynne Burney) will definitely offer this formula again next summer 2016.